Financed by the Horizon 2020 framework programme as part of the Startup Europe initiative of the European Commission, the project DeepTech4Good is committed to helping DeepTech start-ups accelerate their development and scale up their business across Europe. 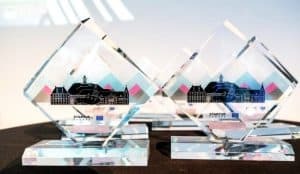 On 26th March 2019, 18 selected start-ups from five European countries pitched their ideas in front of European investors and industry representatives at the Messe Congress Graz, Austria. The start-ups that were invited to pitch at the DT4G#Graz event had been selected from 80 applicants from all over Europe by an international jury. 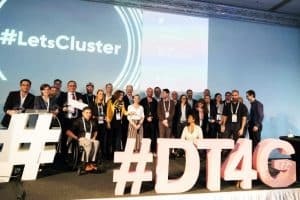 Of the start-ups that pitched, eight were awarded a DT4G#Graz award by the Austrian Startup Europe ambassadors Veneta Buchegger (Silicon Alps Cluster) and Andreas Niederl (JOANNEUM RESEARCH), the hosts of DT4G#Graz. – Smart City: SLOC from Graz. Five of the laureates are from Austria, one is from Germany and two are from France. The winners can look forward to gaining access to a European network. Their collaboration with experts will support them in their future development. Furthermore, DT4G#Graz hosted IndustryMeetsMakers for the first time in Graz. IndustryMeetsMakers provided very interesting insights into selected innovation challenges by leading Austrian corporates. Briefings were presented by Infineon, T-Mobile, Commend, Microtronics, Nokia, WackerNeuson Group, Salzburg Research, Worthington Industries, ZKW and ÖBB. IndustryMeetsMakers is a format that enables corporates and makers (start-ups, students, research teams, etc.) to connect with the aim of finding solutions to practical problems or challenges in industry. DeepTech4Good#Graz was organized as part of the #LetsCluster | Silicon Alps Cluster Festival that took place from 24th to 26th March in Graz with over 900 participants. The next DeepTech4Good event will take place in Barcelona, Spain, on 25th April 2019.